Although obesity, characterized by a chronic inflammatory state and multiple metabolic and hormonal effects, is a known risk factor for certain types of cancers, its specific impact on immune response during tumor progression and in the context of immunotherapy is unclear. In a paper recently published in Nature Medicine, Wang and Aguilar et al. explored how obesity affects T cell function and response to PD-1/PD-L1 blockade. The team began by examining the T cells of diet-induced obese mice and control-diet mice. At the age of 6 months, obese mice had a higher frequency of PD-1+ T cells in the liver, and by 11-12 months, the increase was also observed in the peripheral blood and spleen. The T cells exhibited an increase in the memory pool, reduced levels of IFNγ and TNFα production, as well as reduced proliferation, indicating a dysfunctional exhausted state. These results held true for both CD4+ and CD8+ T cells, and similar observations were made in rhesus macaques and healthy human volunteers, demonstrating obesity-associated immune dysfunction across multiple species. Next, the researchers explored how obesity affects immune response in a tumor setting. B16 melanomas grew faster and more aggressively in 6-month-old obese mice than in controls. Obese mice had higher frequency of intratumoral CD8+ T cells that expressed exhaustion markers including PD-1, Tim-3, and Lag-3. There was no difference in Tregs between obese and control mice. The frequency of EomeshiT-betloPD-1+ T cells also increased in the liver, spleen, and draining lymph nodes of 6-month-old obese mice, indicating that the presence of the tumor accelerated systemic T cell exhaustion in the context of obesity. In their analysis of T cells, Wang and Aguilar et al. noted that tumors in obese mice had increased metabolic activity, and that the expression of the Cpt1a gene (which regulates fatty acid oxidation) was upregulated in both tumor cells and CD8+ T cells, providing a possible connection between metabolism and T cell dysfunction. RNAseq analysis of T cells from tumor-bearing obese or control mice revealed differential expression of genes involved in signaling by leptin, a hormone that is elevated in obesity. The team saw that leptin was elevated in obese mice and this corresponded with an increased frequency of PD-1+CD8+ T cells. Similar results were observed in healthy human volunteers. Interestingly, in mice that lacked the leptin receptor and were thus obese due to the absence of satiety signaling, the frequency of PD-1+CD8+ T cells was lower compared with the leaner wild-type controls, indicating that leptin signaling contributes to PD-1 expression on T cells in the context of obesity. Mechanistic in vitro studies showed that addition of leptin to activated CD8+ T cells led to the upregulation of phosphorylated STAT3, a transcription factor which mediates leptin signaling and is also involved in PD-1 expression. Not surprisingly, leptin dramatically upregulated PD-1 expression, while inhibition of STAT3 had the opposite effect. Having established a link between leptin and T cell exhaustion, the researchers examined the role of leptin in tumor-bearing mice. When B16-bearing leptin-deficient mice were treated with recombinant mouse leptin, they continuously lost weight, but also experienced accelerated tumor growth and increased CD8+ T cell exhaustion in the tumor and liver. These experiments demonstrated that leptin impairs the antitumor response. Given the increased PD-1 expression observed on CD8+ T cells in obesity, Wang and Aguilar et al. treated B16-bearing mice with anti-PD-1. The treatment significantly reduced tumor burden and improved survival in obese mice, but not in control non-obese animals. Similar results were observed in mice with 3LL lung carcinoma. Treated obese mice experiencing an improved antitumor response also had an increase in CD8+ T cells and a reduction of PD-1+ T cells in the tumor, as well as an increased production of IFNγ and TNFα by splenic CD8+ T cells compared to untreated obese mice. In a B16-F10 metastatic melanoma model, anti-PD-1 reduced metastases in obese but not in control mice. Taken together, these experiments showed that anti-PD-1 reinvigorated CD8+ T cells and improved survival in tumor-bearing obese mice to a greater extent than in control mice. Looking to determine clinical relevance of their findings, Wang and Aguilar et al. analyzed the effect of obesity on T cells and the outcome of anti-PD-1 treatment in cancer patients. In 152 patients with colorectal cancer, those with obesity had fewer tumor-infiltrating lymphocytes. In 251 patients with melanoma, obese patients had a higher expression of PD-1 and other exhaustion markers within the tumor microenvironment, and this effect became even more pronounced with age. In a cohort of 250 patients with various types of cancer who were treated with anti-PD-1/anti-PD-L1, obese patients had improved progression-free and overall survival compared with non-obese patients. Together, this data showed that obesity in humans affected T cell function and response to PD-1 axis blockade. Overall, Wang and Aguilar et al. have demonstrated that obesity induced T cell exhaustion and dysfunction in a manner that was at least partially dependent on leptin signaling, and this held true across multiple species and cancer types. 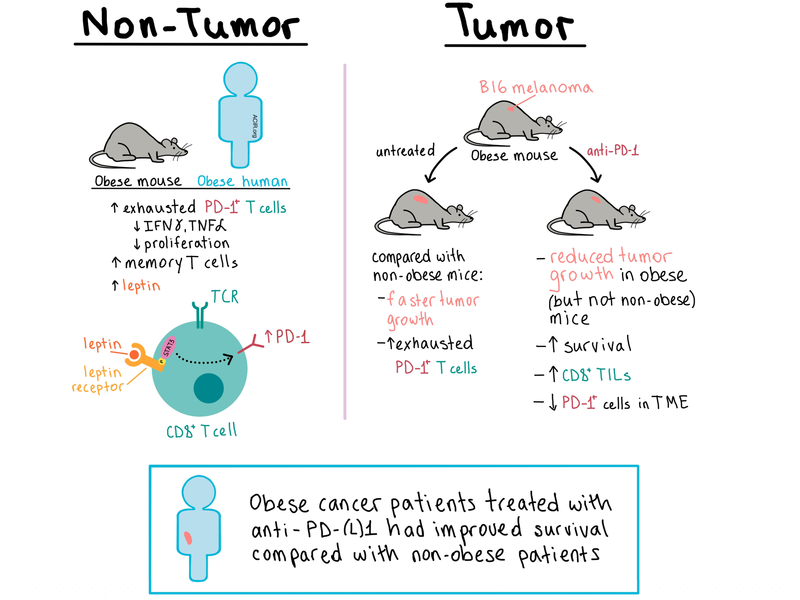 The resulting immunosuppression, together with metabolic effects, led to increased tumor progression in the context of obesity, but also allowed tumors to be more responsive to PD-1 blockade. The authors caution however that, based on these results, obesity should be considered a patient-intrinsic factor that is a possible mediator of immune dysfunction, and not a predictor of positive outcome in cancer treatment. Wang Z., Aguilar E.G., Luna J.I., Dunai C., Khuat L.T., Le C.T., Mirsoian A., Minnar C.M., Stoffel K.M., Sturgill I.R., Grossenbacher S.K., Withers S.S., Rebhun R.B., Hartigan-O'Connor D.J., Méndez-Lagares G., Tarantal A.F., Isseroff R.R., Griffith T.S., Schalper K.A., Merleev A., Saha A., Maverakis E., Kelly K., Aljumaily R., Ibrahimi S., Mukherjee S., Machiorlatti M., Vesely S.K., Longo D.L., Blazar B.R., Canter R.J., Murphy W.J., Monjazeb A.M. Paradoxical effects of obesity on T cell function during tumor progression and PD-1 checkpoint blockade. Nat Med. 2018 Nov 12. Benonisson and Altintas et al. developed a bispecific antibody targeting mouse CD3ε and mouse TRP1 and tested it in a fully immunocompetent, syngeneic mouse B16F10 tumor model. The antibody briefly induced systemic T cell activation, which was followed by an infiltration of inflammatory macrophages into the tumor and a subsequent increase in intratumoral CD4+ and CD8+ T cells and NK cells. All treated mice experienced delayed tumor growth, and 50% survived long term. Tumor eradication could be mediated by CD4+ or CD8+ T cells alone, indicating redundancy, but no formation of long-term memory was observed. CD40 is a key activating receptor on professional antigen presenting cells and is also found on multiple tumor cells. It can trigger immune-mediated and direct antitumor effects. Vitale et al. describe the selection and in vitro and in vivo biochemical and biological attributes of CDX-1140, an agonist-CD40 antibody, which just entered clinical trials. Uniquely, CDX-1140 was selected for moderate, but not high, stimulatory activity to allow saturation of tissue CD40 with limited toxicity. CDX-1140 bound CD40 at a site distinct from CD40L, facilitating synergy. CDX-1140 showed properties expected for a CD40 agonist and was well tolerated in non-human primates.